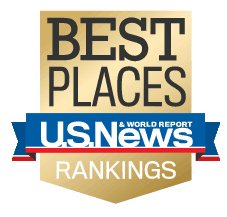 Raleigh, which WPU proudly calls home, has been awarded another top ranking by another top publication – this time, the City of Oaks is officially the No. 4 “Best Place to Live in the United States” according to U.S. News & World Report. The news publication analyzed 100 cities in the U.S. and ranked them based on quality of life and job market, as well as the value of living there and people’s desire to live there. “Many people who call Raleigh-Durham home are young, friendly, diverse and educated. They enjoy dining out in local restaurants – many of which have earned national accolades,” said Chika Gujarathi, columnist for U.S. News. On a 10-point scale, Raleigh achieved an overall score of 7.5 on the report. “Desirability” was valued at 8.6 and “Quality of Life” at 7.4. The U.S News ranking is the latest accolade in a long list for North Carolina’s capital. In 2016 alone, Raleigh has been featured in half a dozen rankings reports, including a Forbes report, which found the City of Oaks to be No. 5 on its list of “America’s Next Boom Towns” (RaleighNC.gov). WPU is located in downtown Raleigh just three blocks away from the Governor’s Mansion and the General Assembly. Many WPU students take advantage of the University’s metropolitan location and intern in political offices, as well as corporate spaces such as Red Hat, Citrix, and Wells Fargo. In fact, William Peace University is one of the top universities in the country when it comes to internships. According to rankings from U.S. News & News World Report in 2013, WPU produced the largest percentage of interns. WPU curriculum focuses on career preparedness as 100 percent of students graduate with an internship. On average, nearly 70 percent of William Peace University graduates receive job offers directly through their internship experience, and more than 90 percent of graduates enroll in graduate school or land a job within one year of graduating. Both 2013 and 2014 classes experienced a 97 percent job/graduate school placement rate. For a complete list of Raleigh’s rankings and accolades dating back to 2009 and earlier, please visit: RaleighNC.gov. For more information on downtown Raleigh and its relationship with WPU, www.peace.edu/OurRaleigh.